Credit: Image courtesy of Sarah Gerrity, Department of Energy. On Thursday afternoon I had the opportunity to sit down with United States Energy Secretary Ernest Moniz, at a restaurant down at Fisherman’s Wharf, for a conversation on how to fund energy innovation and what Silicon Valley’s future role can be. Moniz became Secretary of Energy a year and a half ago, following Steven Chu, after decades as a physics and engineering professor at MIT and a stint as the Under Secretary of Energy in the Clinton Administration. Q. What do you think Silicon Valley’s role can be for energy innovation? As you know, the Valley put a lot of money into cleantech startups several years ago and found the space to be pretty difficult. A. I think there are two different aspects. One is what I’d call the traditional venture capital approach and as you said there was substantial activity a decade ago and I think some fruit will still be born from that. But there was probably some exuberance in terms of how fast investments in the energy space turn over. I think there’s a very fundamental point, which in no way diminishes the importance of investing in these new technology directions, nor the importance of the results from successful ventures, but a lot of these companies had experience generally in the IT realm, where many of the innovations were providing genuinely new services. In the energy space, you’re largely providing the same service — heat and light etc — but with a better and cleaner technology. But the fact is it’s much more of a market area where you’re up against incumbents directly and large capital investments are required. Inherently it’s an area that turns over more slowly. So it requires some patience in that sense. [pullquote person=”” attribution=””]The importance of innovation in cleantech is extremely high[/pullquote]But again, some of these are, and will, certainly pay off. The importance of innovation in cleantech is extremely high. But it should be understood that ultimately the goal of that innovation is cost reduction, which of course if part and parcel of that earlier statement: if you’re not providing a new service, you better be cost competitive. Driving down the cost matters. And we’re having great success with that in solar, wind, LEDs and batteries. In some of those cases, in batteries for vehicles in particular, we’ve had great success getting 3 X cost reduction in 5 or 6 years, but we still need another 2 to 3 X to get there. The second aspect I would note in Silicon Valley is that there are a lot of fantastic companies that are also progressive. I’ll use Google as an example, and they are doing tremendous work in the energy space. Some of it is for their own internal use, and frankly advantage, in the end – energy use in server farms. But some of it is through investing. They were a partial investor in the big concentrated solar thermal plant where the DOE gave a big loan guarantee for the Ivanpah plant. So I think there are companies in Silicon Valley that are advancing the clean energy revolution in some sense by doing it. 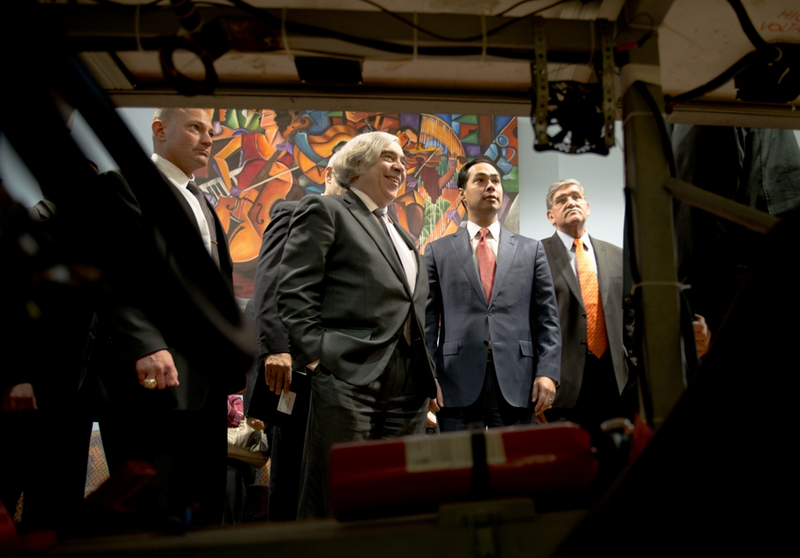 Energy Secretary Ernie Moniz checking out solar cars by students in San Antonio. Image courtesy of University of Texas at San Antonio. Q. Do you think the technology industry in general is doing enough to promote things like clean energy, or being energy efficient, and fighting climate change? A. Well, I’m not going to cast a judgment on what any company is doing. But certainly the urgency of the climate challenge is one that we evaluate as being very important. I have no doubt that the energy system will progress as it has to lower carbon emissions. But we don’t have a lot of time. We have to pick up the pace of change. And that’s one reason why we, the DOE, put our resources across the board, and we work across the entire innovation chain from basic research to deployment. Deployment historically leads to some rough sailing in the political world. But our view is, look, we don’t have time. For example, we continue to advocate and push hard on our loan program. Ivanpah is just one example. We’ve got $30 billion in play and another $40 billion to go. We plan to deploy that $40 billion across the board for clean energy. So push the technology, but push the technology only so far with each project so that you have commercial viability. That’s the sweet spot for the loan program. Q. Are you tweaking the program as you roll out the rest of that $40 billion? A. Yes, and we’re open for business now. I’ll give you two examples of tweaking. One is the Advanced Technology Vehicles Program, that’s where Tesla is our poster child of success, but we’ve also been successful with Ford and with Nissan. With Fisker, we’ll see what eventually happens there. We have, by the way, $16 billion left for the vehicles program. What we have said is that we’re still open for business for auto manufacturers, but we’re making a particularly strong push on the supply chain. To go to suppliers for the kinds of elements — low resistance tires, light-weight bodies, you name it — that will be part of the efficient vehicle of the future. That’s the target for these kinds of technologies. [pullquote person=”” attribution=””]We are planning to move in this direction of co-lending[/pullquote] The second kind of tweak is how we are managing the financing. Up to now, the debt financing for the loan and loan guarantee programs have been more or less handled by the DOE. The first counter example to that is the provisional loan guarantee we’ve announced for Cape Wind, where we, the DOE, will be a minority investor. We are planning to move in this direction of co-lending for two reasons. One is that we’ll make the resources go even further. But frankly, that’s the less important reason. The more important reason is that by co-lending, and given the success of the portfolio up to now, we can help many other financial institutions get involved with these kinds of projects and build up their experience base. Q. So these would be like banks and private equity? A. Yeah, you name it. I think that’s really our strategy. So there’s a little bit different target audience in one case and a different financing structure in the other. Q. That’s for ATVM too? A. Yep, this is for financing across the board. We’re not making this a requirement, we’re maintaining flexibility, but we’re emphasizing we want to go in these different directions because we think strategically they make sense for the portfolio. I would say, though I can’t discuss any individual cases, but we are pretty happy with what looks like a very interesting portfolio for that $40 billion. There’s a lot of apparently interesting proposals. But there’s a lot of due diligence that has to be done. Q. What are the next steps for those funds? A. We have solicitations out for renewables and efficiency. For ATVM we don’t need a new solicitation, but we’ve done a new round of reaching out to industry to tell them, hey, we’re open for business, and by the way, some of the administrative impediments that were there earlier in the program, we think we’ve understood those, we’ve streamlined it and why don’t you come and talk to us for a no-cost consultation for what might become an application. Q. What do you see as the role of government funds for energy innovation versus the private sector? Are there areas that the government is particularly strong at, and other areas that are weaker? A. Again, we are going to work across the whole innovation chain. When you get to the really basic research, there really is no one other than government to do that. So as one of the vehicles that we did early on for some of the more basic research, is we have these energy research centers. In my view they’ve been tremendously successful. The department funded I think 46 back in 2009, and these are typically a few million a year for five years. And they address what the research community identified as the major science challenges that have to be addressed for the next generation of technology breakthroughs. We just had a renewal, in 2014, so we just awarded another, I forget exactly, 32 or 36 centers where 20-some were renewals and the rest were brand new. 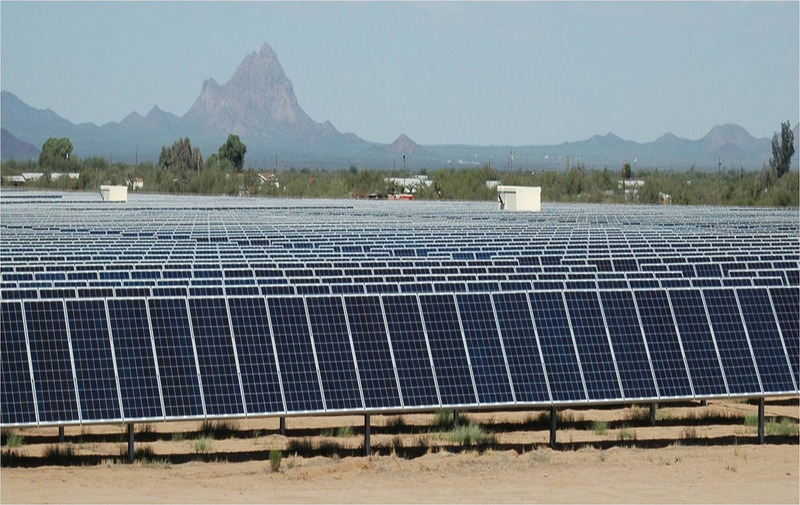 Solar Farm in Tucson, Arizona. Image courtesy of IBM Research, Flickr Creative Commons. Then we have ARPA-E, which is the next step — with a relatively small amount of funding, one can see, in a short amount of time, a defined technology advance, but still pre-marketplace. Going further along in the chain is where what government can and should do has to be carefully chosen. For example, when you take something like carbon capture and sequestration, the real job there is demonstration. So we put $6 billion into large scale, at least a megaton of CO2 per year, demonstration projects. That’s cost shared with industry. And for that problem, that’s the right step. For solar photovoltaics, there we go to the loan program. In 2009, there were no utility scale photovoltaic projects. There was also no debt financing. The loan program was issued for five projects above 100 megawatts, and they’re all going great. Now we’re basically out of that business, because now it’s up to the private sector. There are seventeen projects going on in the U.S. that are completely privately financed. So that is really the pattern we’d like to see — where we’re the first ones, and there’s a lot of risk given the huge financing costs at that level. We get that risk down by having some of these commercially viable projects and then let the private sector take over. We do not want to displace the private sector. We actually want to facilitate getting the private sector engaged in these areas that are still kind of new for companies at this level of capital requirement. Wen you’re talking, you’re not doing. More B.S. from the exporters of jobs who always preach job creation. Oil will NEVER lose it’s stranglehold on politicians and the nation. And I do mean STRANGLEHOLD. America is in a state of COLLAPSE. what a wate of billions of dollars. Have anybody been out to see the Ivanpah solar facility? I have, many times. It’s an ecological disaster. The only energy source with the required energy density is nuclear. Thorium based molten salt reactors are the solution. They can’t melt down, they cant blow up, they prodcue very, very little waste and can be used to consume the current stockpile of nuclear waste. As usual, we’re behind and maintaining that position, as China, Russia, India and others move rapidly ahead with our only prime, clean power source — nuclear. But, what can we expect from a gas guy and an administration that can’t even get decent rare-earth regulations,gun laws, or even stop an Israeli gov’t from tasking lands they were never given, and using $ billions of our each year to do that? The administration doesn’t even get the seriousness of our emissions history and problems rapidly arriving. Nor does it get the immeasurable financial & intellectual harm represented by our giving up the world nuclear-power market to others.